[Armag] diarouga wrote: Well it is sc2, and in sc2 mechanics are more important than strategy. This is just irrelevant in aoe3. Kaiserklein wrote: And have you seen me rehost a game for lag? No. Plus sound bug is way less impactful than lag... If you have eyes on the mini map you don't even need sound, you should actually see the raid before your vils get attacked lol. It's an annoying bug, but that's all. 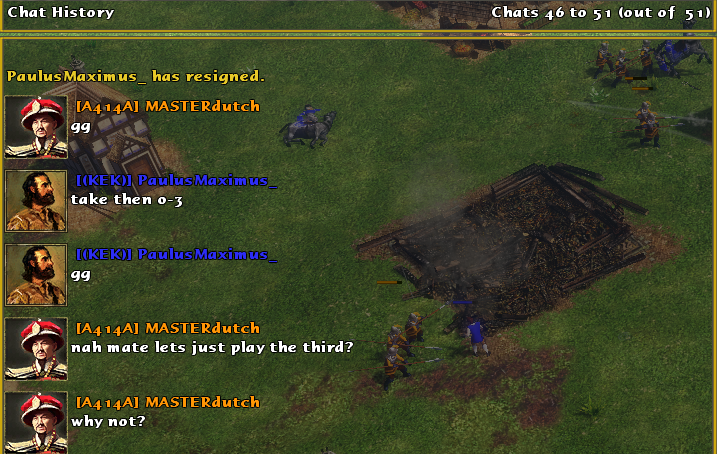 blackwidow wrote: And like i mentioned ingame, i'm happy to play the third one out if paulusmaximus wants anytime. And like i mentioned ingame, i'm happy to play the third one out if paulusmaximus wants anytime. i was also soundbugged (for the first time ever btw :S) and we played 2 games, i won both. I didn't get to play japan, which i played like 98% of my total games played. Even though I didn't bet on this match, I don't think this can be called anything other than a 3-0. Topic: ESOC Patch 6.0.0.0 released! Re: ESOC Patch 6.0.0.0 released!